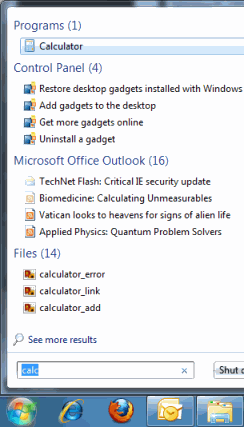 The way in which microsoft has decided to organise the plethora of programs, options and settings in Windows 7 is a nightmare. You would think after 30 or so years of building these things they would have come up with a reasonable and logical way to organise access to the many programs and settings in the OS. The control panel is like an amusement park where you wonder around aimlessly in the hope that you might stumble across what your looking for because you know there are 10 ways to get there. Nevertheless, there is one feature that can save you some time and that's the built in search feature in the start menu. Rather then hunt around like a lunatic through all the menus and control panels just type in what your looking for in the search bar. You don't need to click in the box you can just start typing. In the screen shots shown below you can see that by entering the first few letters of the item your looking for you can quickly bring up the program or setting into the start menu. In the 2 screen shots below I've entered a quick search for the calculator using "calc" and the system power settings using "pow". 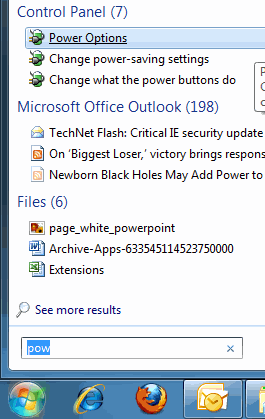 As you can see its listed both items at the top of the start menu. To clear the search result and return to the default menu click the "X" on the right of the search box. Other example search terms are "defrag" for the disk defragmenter and "firew" for the firewall. The search can return programs, control panel items, emails and files. Also, you can customize what items are included in the searched by right clicking the start button, selecting properties and then customize. Here you can can configure whether to include other files and libraries in the search results.